During Apple's Super Tablet 16 this week, Tim Cook boasted of processing performance that kicks Nvidia's Tegra 3 in the face. By a factor of four. Don't believe the hype—ever. "We don't have the benchmark information," [Nvidia spokesman Ken] Brown said. "We have to understand what the application was that was used. Was it one or a variety of applications? What drivers were used? There are so many issues to get into with benchmark." When Apple's new iPad goes on sale on March 16th, NVIDIA plans to run tests in order to determine whether or not Apple's claims hold water. "At some point it will become more clear what the performance really is," Brown concluded. "For now, Apple has a really generic statement." Now of course a direct competitor is going to cry foul when its prized chip is badmouthed at one of the most widely-followed tech events of the year. But Nvidia is spot on—slides like this mean pretty much nothing. Apple provided zero context for the alleged 4x performance dominance, but not even context wouldn't have redeemed a slide like this. Don't ever trust in-house benchmarks—never ask the baker how good his pie is. This has been the futility of corporate, synthetic benchmarking for literally decades: since the days of early GPU wars, the entire game has been rigged. Companies will "test" their products in a race they're bound to win. It's why tests like 3DMark and PCMark are useless. GPU makers have been known to carefully craft new drivers to expressly boost performance in popular games they know reviewers will use—it's all a race to manipulate that bar graph. 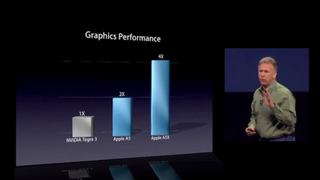 Nvidia is just as guilty of it as anyone else—they make boastful bar graphs too, after all.